Well, it’s been quite a roller coaster year and a half, and there have been many changes in my life! One of them was that I veered off the Vegan track, which is something I’m not very proud of… However, I am happy to say that I am back with a vengeance and excited to start blogging my favourite animal-friendly recipes once again! Warning: These babies are addictive!! I’ve probably made them at least once a week for the last year and just can’t get enough of their crispy deliciousness. They are not only amazing on their own as a snack (think of it as protein popcorn! ), but I also love sprinkling them over salads, or popping them in wraps along with some spinach, hummus, tomato and avocado (or whatever else your veggie heart desires) – yumm yumm…The spices are a rough guide, so you can add whatever you find in your spice rack and think will taste good; but I’m a huge cumin fan and wouldn’t think about leaving out the paprika either. Sometimes I have a lemon & herb spice that I like to add too, but like I said – whatever floats your herb boat! – Preheat oven to 200C/400F and prepare a tray with foil. – Dab the drained Chickpeas with a paper towel until dry and spread onto the tray. – Drizzle Chickpeas with Olive Oil and then sprinkle with Spices & Sea Salt, tossing until evenly distributed (it will get a bit messy if you’re using your hands). 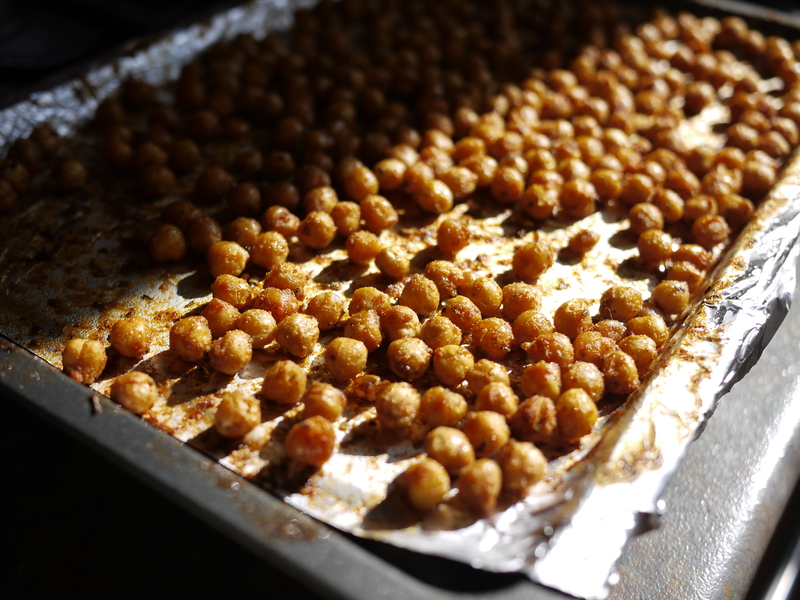 – Place tray in the oven and roast +- 30 mins or until Chickpeas are golden and crispy. Allow to cool completely before storing, if you’re not eating them right away (like that’s gonna happen!). – Boil a pot of water for the Pasta, and cook until al dente and rinse. Preheat oven to 430F. – Heat Oil in a medium sized saucepan and sauté Onions until browned. Add Mushrooms, Garlic and Red Peppers and continue to sauté, adding a dash of Red Wine. Add minced Chorizo, Olives and Herbs and cook a few minutes more. Then add the tinned Tomatoes, with a little water if needed, and allow to simmer for a few minutes. 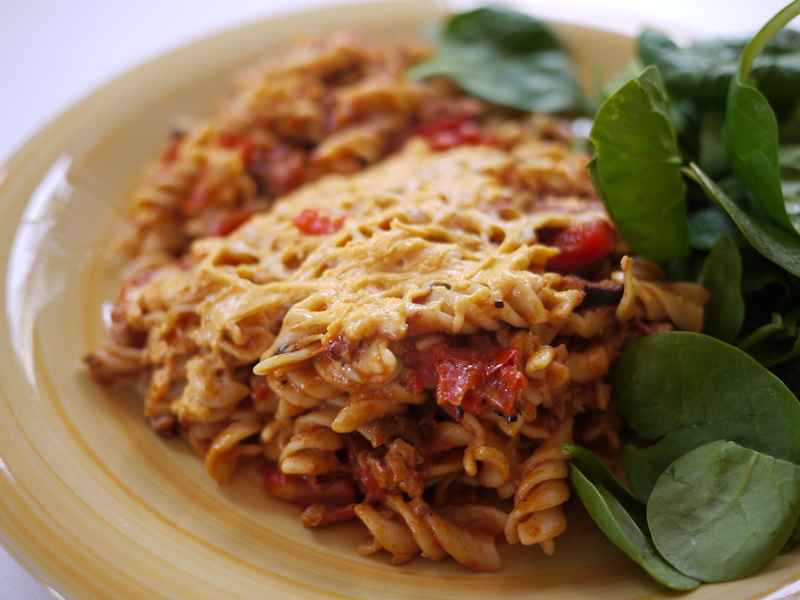 – Add bolognaise sauce to cooked Pasta, mix in a handful of the grated Cheese, then pour into a square baking dish. Sprinkle the top with the remaining Cheese to cover the whole dish, and place in the oven for about 10-15 mins. or until Cheese has melted. Every Christmas Eve, my Mum would bring out her special Christmas Cake for Dessert. She would usually make it at least a month, if not two, before the special day, and then keep it in a cool room, visiting it every few weeks to douse it in Brandy. Actually, she would make up to half a dozen of these cakes over the season, as friends and family placed their orders with her every year. Making it a few months in advance allows the many flavours to develop and the Brandy to soak into the Cake, making it rich & moist. It’s funny, as a child I never really liked this cake (I think it was the Citrus peel my Mum used to put in it, so I’ve left that out and replaced it with Zest instead), but as I get older I crave this every year, and no Christmas would be complete without it. Since my Mum passed away I’ve been keeping up the tradition, but with a veganized version! Here is my adaptation of her wonderful cake – I hope you get to share it with your family this Christmas. And make sure you cover it in Custard! – Preheat oven to 140C. Line & grease 20cm round cake tin. – Place Butter, Fruit, Sugar, Water, Baking Soda & 1 Tblsp. Brandy in a saucepan and bring to the boil. Allow to boil around 5 mins. Remove from heat, and add Egg Replacer. – Sift dry ingredients into a large bowl, and add fruit mixture folding in gently until blended. 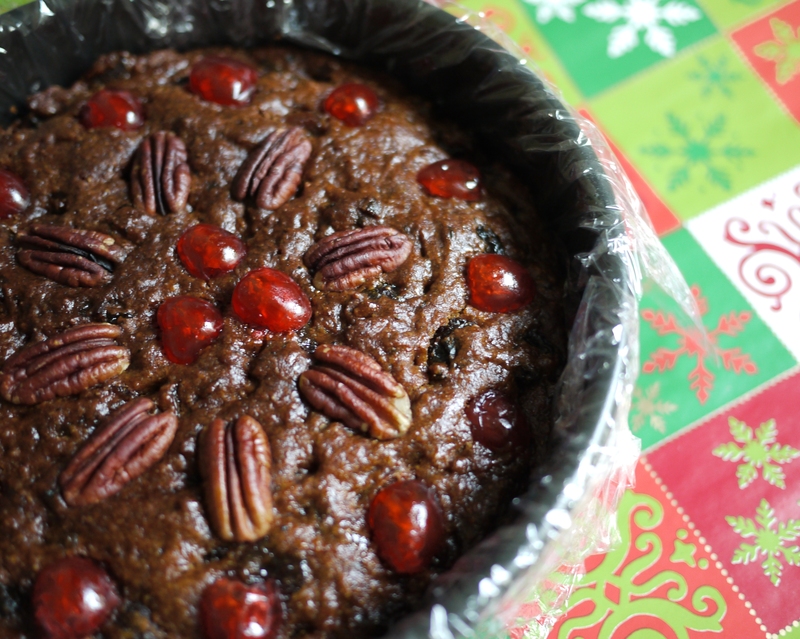 – Pour into prepared tin and, working quickly, decorate the top of cake as desired with Pecan Nuts and Glace Cherries. – Once removed, pour remaining 1 Tblsp. Brandy over cake while still hot. Allow to cool in tin, then wrap cake in cling film, place back in tin with a lid and keep in a cool dark place. Every 2 weeks, open cling film and pour 2 -4 Tblsp. Brandy over the top of the cake, covering it again right away to let the alcohol soak in. The Master Cleanse is a program I like to follow once or twice a year – it’s definitely a personal thing, and not everyone agrees with the methods used. Since I first tried the Master Cleanse 2 years ago, I’ve had many friends asking me to share the details with them so I’ve decided to put them down here for anyone that may be curious. Created by Stanley Burroughs, it is basically a Juice Fast of a minimum of 10 days which is said to clear your kidneys & digestive system, eliminate toxins in the body, balance your PH and get rid of Parasites & stomach ulcers. It also obviously helps you lose unwanted weight, but often this can come back very fast if you go back to your old eating habits right away. You would think that after a few days of no food you would have no energy and feel awful, but actually on the Master Cleanse you end up having more energy most days! You might have a few days where you will get headaches and feel unwell, but this is usually in the beginning and is a sign that your body is releasing toxins. As I write this, I am on my 9th Day of the Cleanse, and I’m feeling great – this will be my 4th completed Master Cleanse. The reason I like to do this every now and then is to give my body a chance to give itself a spring clean – by not having to waste energy on digesting food, energy is freed up in your body to use on other tasks, like eliminating stored toxins and purifying cells. There is a certain willpower needed, however, for 10 days of strict non-eating: you need to prepare yourself, and plan ahead so that it’s at a convenient time (not when you have a full social calendar, for instance). For 10 days you will need to dedicate time to yourself by doing light exercise, tackling tasks in the house that you’ve been avoiding (cleaning out cupboards, organizing wardrobes, etc. ), reading, going for massages & facials, and enjoying activities with friends & family that don’t involve eating or drinking (this can be hard! Movies are a good choice, as well as hiking or going to the beach). I also find that I benefit from doing Yoga and Meditation when I’m cleansing – anything to help de-stress my body and get rid of toxins faster. I like to do the cleanse over a week that I’m busy with work, as I can just make a large bottle of the Lemonade to take with me and I’m distracted all day. I wouldn’t recommend starting the Cleanse on a workday though – the first day you will need to be able to rush to a toilet at any given time, but eventually you will get into a routine and from Day 2 or 3 it will be easier to plan. – The night before you start, have a cup of Senna tea (laxative) before you go to bed. This will be repeated every night while on the cleanse. – On the first morning you need to have a Salt Water flush when you wake up. Salt Water Flush: 2 tsp. non-iodized Sea Salt, mixed with 1 Quart (1 Litre) of warm water. Take your time and drink this over a period of 10 mins. or so, it’s not easy but just imagine you are drinking soup. This will take roughly an hour to go through your whole system, and then you will be urgently running to the toilet. It is painless, but difficult to control. It is recommended to do this every morning while you are on the cleanse, however, you may have another Senna tea in the morning instead, as long as you do the Salt Water Flush atleast 3-4 times during the 10 days. Personally, I find the Senna tea gives me terrible cramps, but it takes about 6-8 hours to work so you can plan it into your day easier…Sometimes I have the Salt water flush in the evening instead, if I’m short on time in the morning. If you can get hold of fresh Sugar Cane Juice (easier to find in Asia), then this can replace the Maple Syrup & Water – this is the first time I’ve tried the alternative combo and I definitely like it better than the Maple Syrup. I also find that I had a lot more energy and I didn’t loose as much weight as fast. If you find the Maple Syrup too sweet you can reduce it by 1 Tblsp., just remember to drink more lemonades as you will be cutting out calories that your body needs for energy. 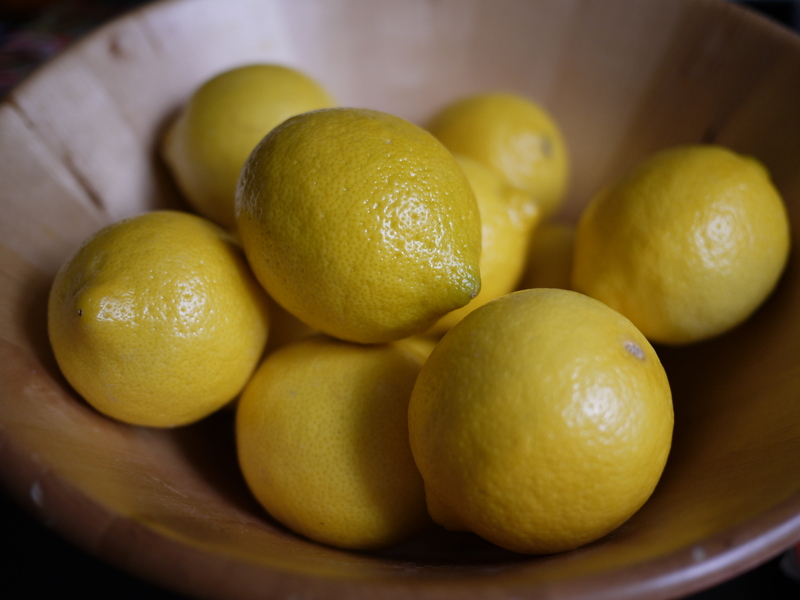 The Lemon Juice neutralizes acids in the body, oxygenates tissues and blood, and is loosening & cleansing. The Cayenne Pepper is also alkalizing, helps to break up & loosen mucus and waste, builds blood, and increases body temperature. The Maple Syrup is a balanced sugar and contains many minerals and vitamins. Your body will need it for energy so that you are not starving it. The Laxative Tea and Salt Water Flush help to flush out the toxins and waste that are being freed up in the colon. – Caffeine-free Herbal Teas (like Mint tea) can be had on occasion for a change of flavour. – After the Cleanse, Day 11 & Day 12: You need to break the Cleanse slowly by consuming fresh Orange Juice, and eating Orange segments, if hungry. This will help prepare your stomach for digestion again. If you cannot tolerate Oranges, then Papaya or Pineapple in small amounts are also allowed. Take it easy and chew everything well. Day 13 I usually have fruit and a raw Salad, and then slowly incorporate cooked Vegetables and Grains in the days to follow. Eat slowly and carefully, and listen to your body. Go ahead & give your body a chance to revive! A lot of the dishes I make are often inspired by something I’ve seen or eaten before at a restaurant, and this is especially true for raw dishes as I’m still quite an amateur when it comes to ‘uncooking’. I first tried this creation in the Living Food Cafe in Phuket, and only because it was recommended to us by another customer – I was quite skeptical of the sound of it. I may have mentioned before that I was never a big fan of mixing fruits with vegetables, but honestly the mix of Papaya with the savoury flavours work wonderfully! Add chopped Mango to your salsa and you’ll be in raw heaven…Trust me, this combo is delicious & satisfying, and makes a great starter or even a light dinner. Don’t use Papaya that is too ripe, as it won’t keep its shape! – Peel Papaya and cut off top and tail. Cut into thick, even sized rings and carefully scoop out seeds from the centre of the rings. Place on plate. – Mix ingredients for Salsa in a bowl and set aside. – For the Guacamole, place all the ingredients together in a bowl and mix well, mashing the Avocado until a few chunks remain. Taste, and adjust seasonings. 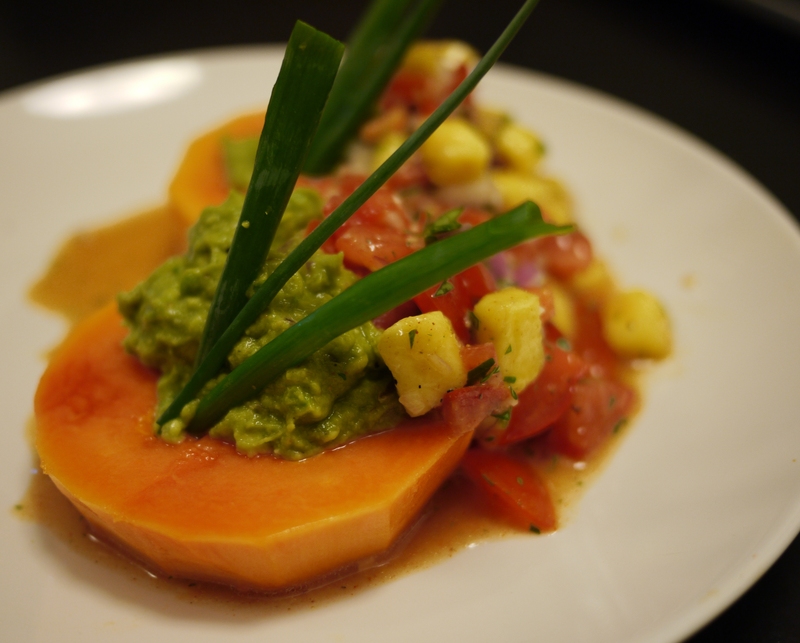 – Scoop a large spoonful of Guacamole onto each Papaya ring, followed by a spoonful of Salsa. Decorate with Spring Onion if desired. *Eat with a knife & fork, and enjoy! On a recent quest to detoxify my body, and lacking the willpower for another 7 day liquid cleanse, I decided to stick to a Raw menu for a few weeks. This dish is just one of the many delicious & satisfying meals I have been feasting on, which I decided to recreate after having it at one of my favourite Veggie haunts. To be honest, the idea of eating Zucchini uncooked has never really appealed to me – along with Broccoli, Cauliflower and Mushrooms…And so, despite the hype around Zucchini ‘Pasta’, I hadn’t even considered trying it – until it was the only raw choice on the menu one night, and now I’m so glad I did! Julienning the Zucchini into long, thin strips creates mock noodles with just the right texture, and they’re packed with fibre & water unlike heavy, starchy pasta. But it’s the zesty Basil Pesto and juicy Cherry Tomatoes that make this dish so heavenly – nothing can beat homemade Pesto! I like mine with lots of garlic, so if you’re not a big fan then adjust accordingly. These noodles are topped with Gomasio (a mixture of Sesame Seeds & Salt) for some crunch, but you can just as easily replace it with finely chopped Almonds or Sunflower Seeds…You’ll be surprised by how filling this dish actually is! – After washing the Zucchini, cut the tops & tails off and, using a Mandoline, julienne into long, thin strips (make sure they are not too thick). Place in a large bowl, along with the Cherry Tomatoes and Sundried Tomatoes. – Combine all the ingredients for the Pesto in a food processor or high-speed blender, and blend until mostly smooth. 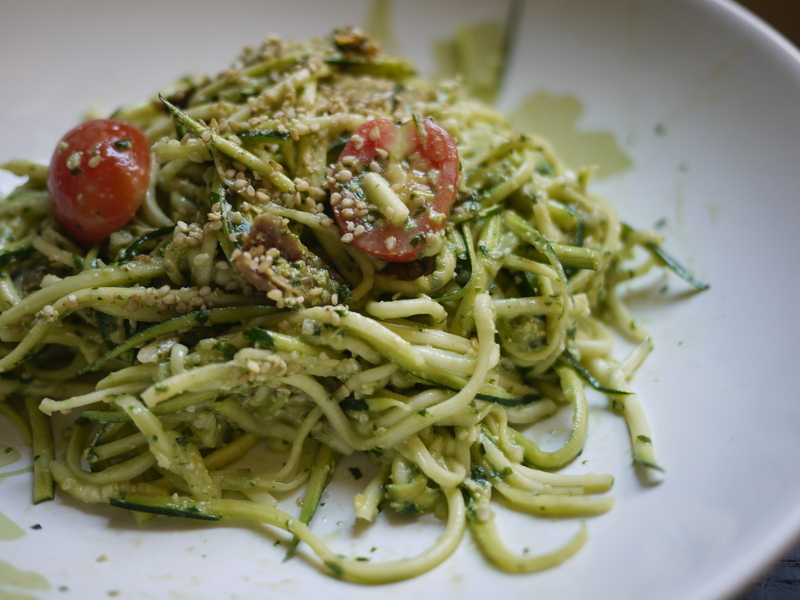 – Mix Pesto with Zucchini Noodles (you may only need half the batch), and top with Gomasio. – Preheat oven to 180C/350F, and spray a 8″ loaf pan or 9″ square pan. – In a medium bowl, combine Carrots, Flax Seeds, Agave, Maple Syrup, Soy Milk, Oil, Vanilla, Vinegar and Lemon Zest. Set aside for atleast 2 minutes. – In a large bowl, sift together Flour, Cinnamon, Baking Powder, Baking Soda and Salt. Add Coconut, and stir to combine. – Pour the wet ingredients over the dry and stir just to combine. Pour the batter into the pan and smooth the top. – Bake in preheated oven for 35- 45 minutes (the loaf pan takes longer than a square pan), or until a tester inserted in centre comes out clean. 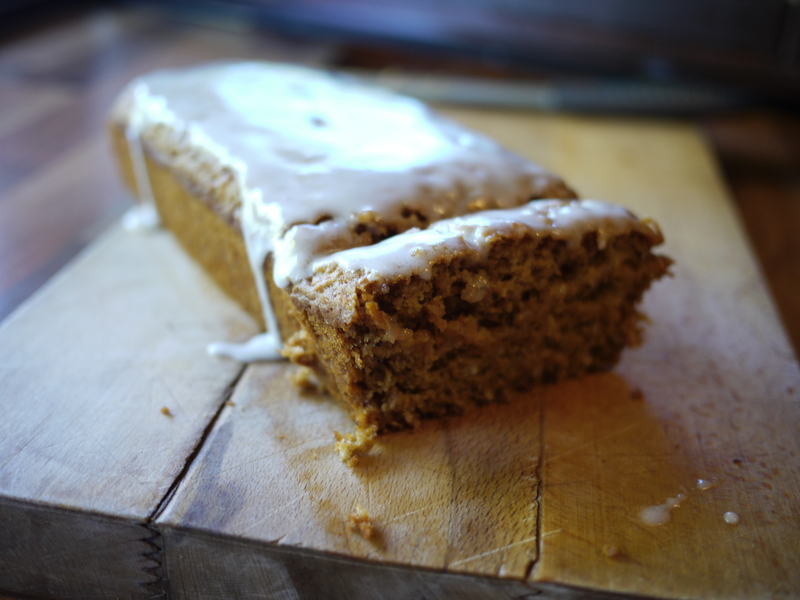 – Allow to cool completely until removing from pan, and covering with Lemon Glaze. – Slowly add Lemon Juice to Icing Sugar until the right consistency is achieved. Pour over Carrot Loaf and allow to set. PS: This would be delicious with the inclusion of Nuts, too!